The No. 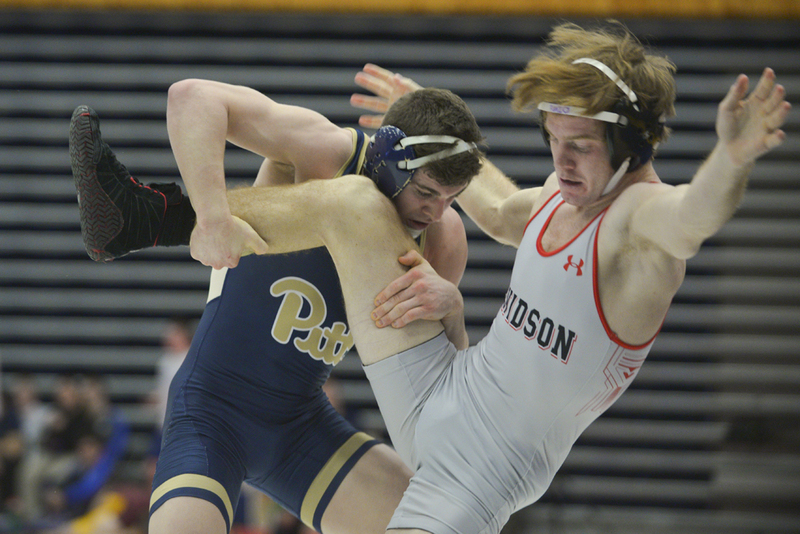 25 Pitt wrestling team received a boost from the return of its best wrestler Friday night, but it wasn’t enough to hold off a late comeback from the No. 8 North Carolina State Wolfpack. Pitt junior Dom Forys — the No. 8 133-pounder in the nation — returned against the Wolfpack after missing the Panthers’ past two weekends of competition with an injury, according to Pitt officials. Forys rolled to a 15-4 major decision, helping stake Pitt (8-5 overall, 0-3 ACC) to an early lead in the dual meet. But NC State (11-1 overall, 4-0 ACC) finished strong, winning the final three matches to clinch a 23-15 victory in Raleigh, North Carolina. Rather than the typical meet start of 125 pounds, the opening match of the night featured the heavyweights. Pitt’s No. 19 Ryan Solomon took on No. 21 Mike Kosoy in a slow and methodical battle that lasted into overtime. The only points scored in regulation came from escapes, but Solomon secured a takedown late in the second tiebreaker period to win the match 5-2 and give the Panthers a 3-0 lead. At 125 pounds, the Wolfpack’s Sean Fausz defeated Pitt sophomore LJ Bentley to tie the meet. Fausz controlled the first two periods with three takedowns while Bentley only scored off escapes. Bentley scored his first takedown in the third, but Fausz held on to win the match, 10-5. In the third match, Forys made his victorious return, dominating No. 14 Jamal Morris of NC State. Forys jumped ahead early with a takedown and back points, then tacked on four more takedowns in the third period to wrap up the 15-4 major decision and give the Panthers a 7-3 advantage. The Wolfpack’s highest-ranked wrestler, No. 2 141-pounder Kevin Jack, then easily defeated Pitt redshirt junior Nick Zanetta by a 19-6 major decision. Jack had two takedowns in the first period and then another three in the second. Zanetta mainly scored off escapes, but had one takedown in the third period. With the meet tied 7-7, Panthers senior Mikey Racciato took the mat at 149 pounds against NC State’s Beau Donahue. The match was fairly even through the first two periods, with both wrestlers scoring a takedown and multiple escapes. In the third period, Racciato pounced on a takedown and pinned Donahue at the 6:38 mark to tally six points for Pitt, giving the Panthers a 13-7 lead. Pitt had a chance to build on that lead at 157 pounds, as redshirt freshman Taleb Rahmani fought back against Thomas Bullard to force overtime. But Bullard took Rahmani down in overtime to decide the match, 9-7, and the referee deducted a point from the Panthers’ bench, trimming Pitt’s lead to 12-10. At 165, No. 11 TeShan Campbell put together another win for the Panthers to improve his season record to 15-2. His 5-1 decision over Brian Hamman gave Pitt a 15-10 lead, but the Wolfpack took control from that point. NC State 174-pounder Nick Reenan dominated Panthers sophomore Donovan McAfee on his way to a technical fall, but instead the referee disqualified McAfee for stalling as time expired, giving the Wolfpack an additional team point and a 16-15 lead. Michael Macchiavello then followed for NC State with a 9-4 win over Pitt redshirt sophomore Zach Bruce at 184 pounds. Macchiavello started the match out strong with three takedowns in the first two periods. Bruce tried to mount a comeback in the third, but Macchiavello held him off to extend the Wolfpack’s lead to 19-15. Going into the last match of the night, Pitt needed a technical fall or a pin at 197 pounds to pull off the upset. Unfortunately for the Panthers, NC State’s Malik McDonald beat out Pitt senior John Rizzo in a 10-2 major decision to clinch the 23-15 match victory for the Wolfpack. The Panthers will return home to the Fitzgerald Field House for a non-conference showdown with Iowa State at 7 p.m. Friday, Feb. 10.